I know it sounds like I’m doing research in something that has been studied before, but I believe that we don’t understand in depth how the invention of the Greek alphabet really was – if we ever get to understand it. Most of the previous studies about the Greek alphabet tried to figure out when it was created, where or how Greeks adapted the Phoenician letters and their shapes to write their own language. The Greeks themselves were very conscious about where their alphabet was taken from: Herodotus called it φοινικήια γράμματα, that is, Phoenician letters. The post is a sort of personal reflection (hence the picture! ), explaining how the CREWS project was inspired by my previous research during my time as a British Academy Postdoctoral Fellow. Please follow the link above if you would like to read more. The new issue of Pan European Networks’ Science and Technology magazine (Issue 19, June 2016) features a 3-page spread on the CREWS project. If you would like to read more about the remit and the aims of the project – and why ancient writing systems and the people who used them are worth studying – then you can read the whole article for free online. Just click on the link below, and the article is on p72-4. In conjunction with the appearance of the article, I also did a fifteen-minute interview with Pan European Networks to say a little bit about the basis for the project’s research and how people can get involved with it, as well as the importance of European funding for endeavours like this one. 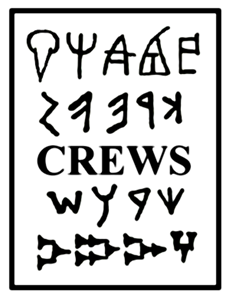 These two links offer a great way of finding out a bit more about what we are planning to do with the CREWS project. There will undoubtedly be more such features that I will of course share (when someone asks me to enthuse on the subject of ancient writing systems, I find it hard to say no! ), and in the future some more definite ideas about how YOU can get involved in the project.